Pregnancy has really forced me to change my approach to daily dressing. Pre-preggo I was exclusively a jeans and tee girl, yeah I loved dressing up for events but it takes a lot to get me out of my beloved jeans. Since around the 24week mark though jeans just really haven’t been a comfortable option for me, even the maternity jeans get uncomfortable by the end of the day (and require a second person to help me get them off). As a result I seem to have more skirts and dresses in my wardrobe than I ever have in my life. 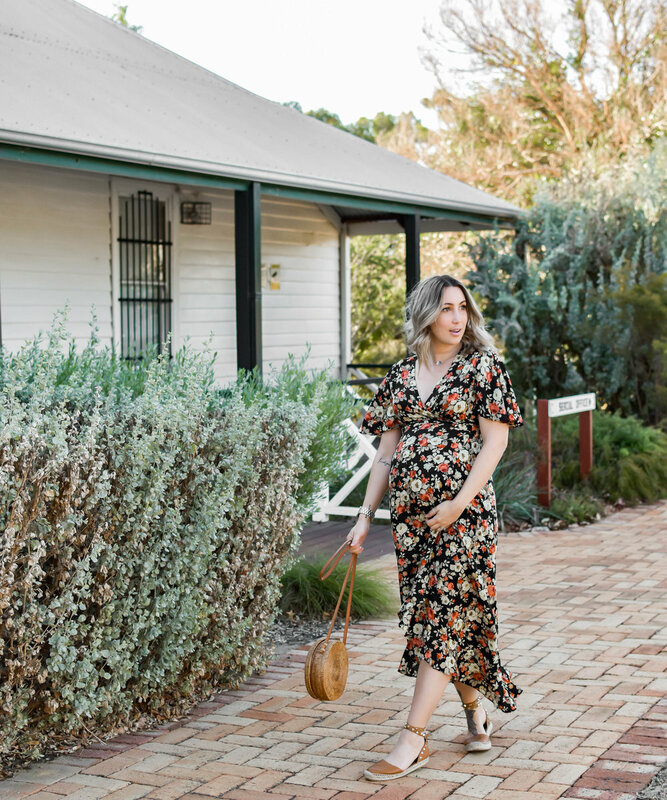 One of my favourites right now is the Harlow Wrap Dress from maternity boutique, Maive & Bo. I’ve been wearing it a lot this last few weeks because it’s just so damn comfortable and the dark floral print is feminine without being too girly which suits my style. I get so frustrated with some maternity styles because I feel like a lot of them have a real “Grandma style”. This style though is perfect for pregnancy with the right balance of coverage (hiding those swollen or more rounded bits) while still being stylish and flattering on the bump. The fabric is light enough for the warmer months and adding a jacket makes it perfect for Autumn weather and creates a more casual look. I even leant this dress to my sister (also pregnant) who has a different body shape to me and it was just as flattering on her so you know it’s a good style. It’s definitely been a maternity favourite that will be worn on repeat.